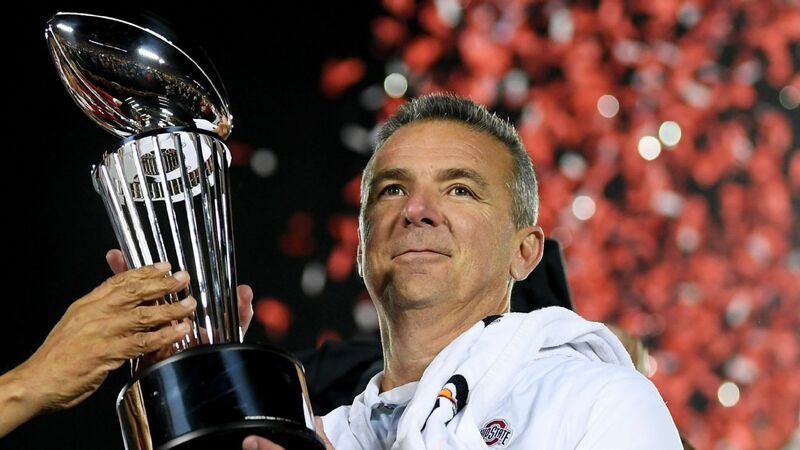 Urban Meyer's Rose Bowl triumph in his last game at Ohio State should have been pure celebration. But it's hard not to think about the off-field issues with his teams when evaluating his career. Urban Meyer reaffirmed his belief that he has coached his last football game, and his wife, Shelley, also said that she would be "ecstatic" if he didn't coach again. During his final postgame speech as head coach, Urban Meyer hands his whistle to Ryan Day, who will become the 25th head coach of the Buckeyes. In Urban Meyer's final game at Ohio State -- and possibly the last one for QB Dwayne Haskins, too -- the Buckeyes held on to take down Washington. Urban Meyer finishes his coaching career with a win at the Rose Bowl as Dwayne Haskins throws for 251 yards and three touchdowns. Ohio State quarterback Dwayne Haskins reflects on the Buckeyes and his season with Maria Taylor after defeating Washington in the Rose Bowl. Urban Meyer reflects on his career with Rece Davis after hoisting the Rose Bowl Game trophy. Urban Meyer reflects on his career and his team after Ohio State defeats Washington in the Rose Bowl 28-23. Chris Fowler sits down with Urban Meyer to reflect on his coaching career, his plans after football, and his first appearance in the Rose Bowl. A quarterback with first-round potential as a passer is a rarity in Buckeyes history and could signify a change in philosophy under Day. Urban Meyer addresses his emotions coaching in the Rose Bowl in his final game at Ohio State. Ohio State coach Urban Meyer recalls the time he tried unsuccessfully to visit the Rose Bowl as his team gets set to take on Washington. Urban Meyer said having Ryan Day on staff to take over made walking away from coaching at Ohio State possible. Dwayne Haskins will wait until after the Rose Bowl to make a decision on his playing future, but the Ohio State quarterback says he feels prepared to play at the next level if he chooses to. Todd McShay discusses who the best NFL prospects are in this year's Rose Bowl, including Ohio State quarterback Dwayne Haskins. It's the first time in the CFP era the Rose Bowl gets its traditional matchup. It's also the last bowl game for Ohio State coach Urban Meyer, who is retiring after the season. Dan Fouts, Lynn Swann, Bob Griese and others will speak at a ceremony honoring broadcasting legend Keith Jackson, who died in January. The future looks bright for Georgia as the Bulldogs are quickly building front-line talent and depth that rivals Alabama, Ohio State and Clemson. The best image from Monday's Rose Bowl came just before kickoff from a photographer high above the stadium in his single-engine Cessna 206. The Crimson Tide have been among the favorites to win the College Football Playoff championship all season, and now that they have reached the title game, they are a four-point favorite over Georgia. In a Rose Bowl for the ages, the Bulldogs rallied to take down Heisman winner Baker Mayfield and end the Sooners' season.